Is there anything more delicious than prosciutto pizza? Well, there is when you add two melty cheeses, sweet pears and creamy caramelized onion. If you’re looking for a new and exciting way to jazz up pizza night, look no further than this tasty prosciutto pizza recipe. 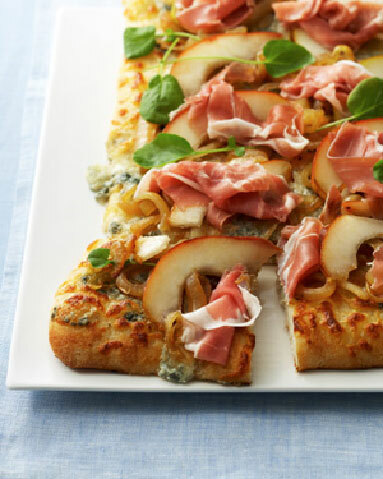 Our Prosciutto di Parma Pizza with Two Cheeses, Pear and Caramelized Onion is an impeccable combination of salty, sweet and creamy. You won’t even want to share (and we won’t make you)! Heat large skillet over high heat, add olive oil. Add onion; reduce heat to medium. Cook, stirring frequently until onions are very tender and well browned, about 30 minutes. Stir in honey. Meanwhile, spread pizza dough on greased baking sheet; press to make 7×13-inch rectangle. Sprinkle with Mozzarella and Gorgonzola. Bake in upper third of oven for 10 minutes. Remove from oven. Top pizza with onion and pear slices; return to oven, about 1 minute. To plate, top with Prosciutto di Parma strips. Garnish with watercress leaves, if desired. Serve immediately.